As the latest national-accounts data from Eurostat reports, the European economy remains in a state of de facto stagnation. According to inflation-adjusted numbers, GDP growth for 2014 stood at 1.3 percent; while much better than 0.04 percent for 2013, a closer examination shows that it is neither impressive nor sustainable. Unlike the growth in the U.S. economy, which originates in sustained growth of domestic, private-sector activity, Europe’s increase in growth is driven primarily by exports. In 2013 exports from the European Union grew by 2.16 percent in inflation-adjusted numbers, a number that increased to 3.53 percent in 2014. There is a sharp contrast between these growth numbers and those for private consumption: -0.1 percent in 2013 turned into growth of 1.29 percent in 2014, hardly an impressive number. 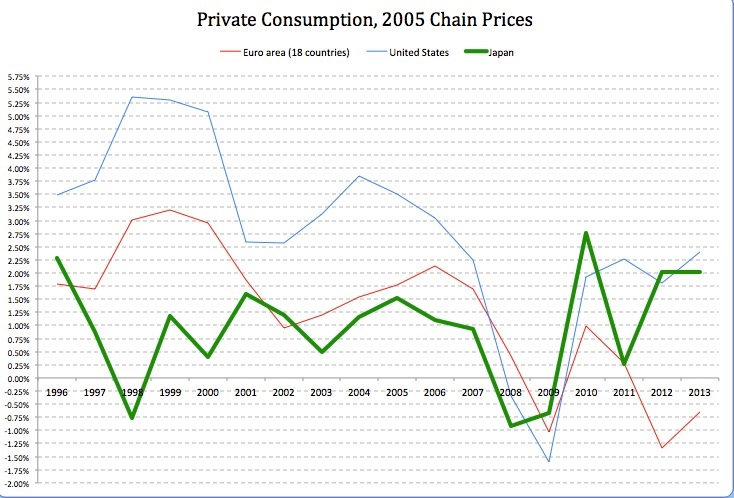 Since private consumption barely moves, businesses have no reason to invest for the domestic market. They therefore tailor their business expansions – to the extent such expansions take place – to fluctuations in foreign markets. The long-term trend of growing dependency on exports is visible across the board in the EU. From 2011 to 2014 (4th quarters), exports share of GDP increased in 23 of the 26 member states included here. While there is nothing wrong inherently with growing exports, there is a problem when an economy almost entirely depends on exports. Contrary to prevailing wisdom among, primarily, European economists there is no lasting positive “multiplier” effect from exports to the rest of the economy – except, as mentioned, the business investments that relate specifically to exports. The lack of positive multiplier effects from exports to, e.g., private consumption is reinforced by the fact that government spending is the strongest or second-strongest growth variable in 15 of the 26 countries. 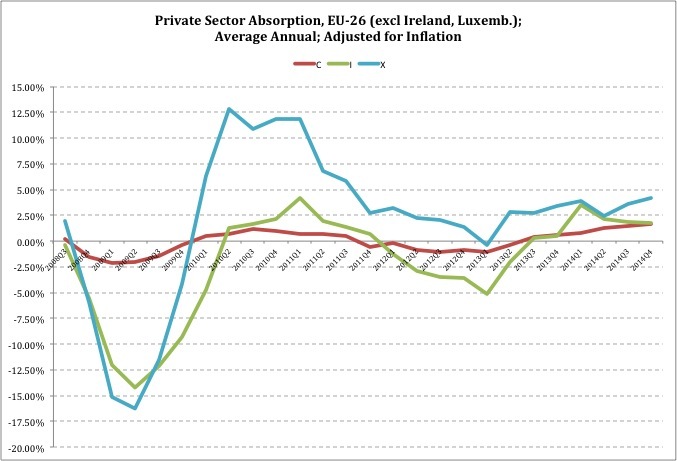 This is remarkable: for all of EU-28 government absorption grew at an annual rate of 0.6 percent per year over the 2013-2014 eight quarters. The fact that this was enough to finish second speaks volumes to the overall weakness of the European economy. So long as this weakness remains, there will be no reversal of the long-term decline of EU economy. *) Eurostat, 2005 chain-linked national accounts data. Yesterday I reported some data showing that the U.S. economy is in good shape from a structural viewpoint. Household spending and business investments – domestic private-sector activity – today absorb a larger share of output than they did under the Bush Jr. administration. Government consumption and investment spending has taken a step back, and the foreign trade balance is in better shape today than at the height of the Bush business cycle. Today, let’s look at the same macroeconomic data from another perspective. When an economy grows faster than two percent per year it provides opportunities for people to achieve a standard of living higher than what previous generations have accomplished. Growth below causes stagnation or even a decline in the average standard of living. * From this perspective the American economy is just about keeping its nose above the water. It could do much better, but two factors are holding us back: the Obama administration’s affinity for heavy-handed regulations, and the combined global effects of a China in recession, a Europe in stagnation and a Russia in Ukraine. In other words, as the sole engine pulling the industrialized world forward, the United States is doing a reasonably good job. More details from the GDP growth numbers reinforce this conclusion. There is, e.g., private consumption which over the past three years has averaged 2.1 percent in annual growth. For 2014, though, the preliminary growth rate was 2.5 percent, a good but not excellent number. Underneath it, though, is some good news: spending on durable goods – household appliances, automobiles etc – has averaged 6.5 percent per year since 2012. This means two things: American families are improving their credit scores again after taking a beating in the trough of the Great Recession; and they are more optimistic about the future. This optimism is corroborated by encouraging employment, which we will get to in the fourth and last part of this series. Next growth peak is 13.5 percentin Q1 2012. From thereon the amplitude declines, forming a “confidence cone” where the annual rate stabilizes around 5.7 percent per year. A good number, the stability of which makes it even more impressive. At the same time, no story of capital formation is complete without a detailed look at what kinds of investments businesses make. Here, again, there is an encouraging pattern of stability. Fixed investment falls into two categories, non-residential and residential, with the former constituting about 80 percent of total fixed investment. In this group spending is divided into structures, equipment and intellectual property products. Again the proportions between the different categories remain stable over time, with the equipment category representing 45-47 percent of non-residential investments. While homes construction was weak in 2014 – growing by only 1.64 percent – it finished strongly in the fourth quarter at 2.6 percent over Q4 2013. But the residential investment numbers for 2012 and 2013 were downright impressive: 13.5 and 12 percent, respectively. Finally, a word about government spending. Many people unfamiliar with national accounts make the mistake of looking at total government outlays as share of GDP, whereupon they understandably get outraged about how big government is. However, in order to understand the role of government properly one has to remove the financial transactions from government spending: GDP only consists of payments for work – by labor or capital – or for products. A financial transaction such as a cash entitlement does not pay for work or products, and therefore has no place in GDP. The government spending included in GDP is payments for teachers in public school, police officers and tax collectors, as well as products such as tasty lunches for middle-school kids and gasoline for the presidential motorcade. It is also investments such as new highways and faster trucks for the postal service. All in all, then, the U.S. economy is in reasonably good shape. This does not mean that cash entitlements such as food stamps are not a problem. They are. But with this stable macroeconomic foundation the U.S. economy is well suited to handle reforms to entitlement programs. Check back after the weekend for the two remaining installments in this series. Larson, Sven: Industrial Poverty – Yesterday Sweden, Today Europe, Tomorrow America; Gower Applied Research, London, UK 2014. Last week I mentioned Japan in an article about France. Quoting an article from Forbes Magazine I made the point that Japan has been stuck in the liquidity trap for a very long time, and that the inflation the country is now experiencing is of the dangerous, monetary kind. The Japanese story illustrates why it is so dangerous for Europe to try to get out from underneath a perennial recession by aggressively expanding money supply. The lesson for Europe stands firm: printing money when there is no demand for that money is a thoroughly bad idea, and Japan is a good example of why. From the time the Japanese deflation era started, in the late ’90s, the growth rate in the money supply accelerated. This went on for most of the next decade and a half; coincidentally, starting in the late ’90s Japan experienced almost 15 years of deflation. It is, in other words, safe to warn the Europeans that massive expansion of the money supply will not break deflation. But it is also important to acknowledge that Japan is now showing signs of leaving deflation behind, just as the Forbes article suggested. The problem is that the new Japanese inflation is not of the kind that Forbes suggested. I quoted the article and took its point as given – it referred to a side point in my article and therefore I accepted the conclusion of what looked like a credible source. But I also had an unrelenting feeling that I needed to look into the veracity of the point from the Forbes story. After all, if Japan had suddenly gone from deflation to inflation without an underlying upturn in real-sector activity, there would be a big case for studying the transmission mechanisms that channeled all that extra liquidity into prices. In other words, it would have been a historic opportunity for monetarists to prove that their theory of inflation is actually true. It would be “true in the long run”, a 15-year long run, but it would nevertheless be true. As I started digging through national accounts data it turned out that Japan is not at all entering an era of monetary inflation. The push upward on prices originates in the real sector: production, consumption and gross fixed capital formation (business investment). Japanese GDP growth exhibits some volatility, but since 2011 the trend is closer to the American economy than the euro zone. Here the trend is actually fairly good for an economy that has been stagnant for almost two decades. It is still nothing to cheer about – Japan, like the United States, cannot break the Industrial Poverty line of two percent. But at least Japanese consumers are out there spending money, which is far more than you can say about their peers in the depressed euro zone. This is perhaps the most compelling piece of evidence that the Japanese economy is in recovery mode after 15 years in the economic wasteland. Growth rates in corporate investments are not ecstatically high, but they are the best since the mid-’90s. 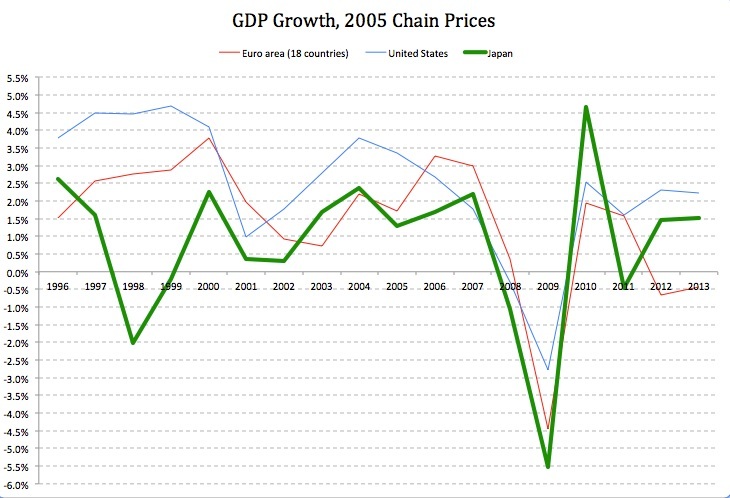 Again, activity in the Japanese economy is showing the same modest but real recovery tendency as the American economy. Normally, growth rates around two percent should not even come close to driving inflation. However, with 15 years of stagnant business investments there is very little excess capacity in the economy. Add to that a shrinking work force and the capacity ceiling is lower in Japan than in many other economies. So there you have it. Japan is leaving the shadow realm of stagnation and deflation. The real sector is recovering, and with production capacity adjusted to stagnation, not growth, excess-demand inflation sets in earlier than in, e.g., the United States. Not to mention Europe. 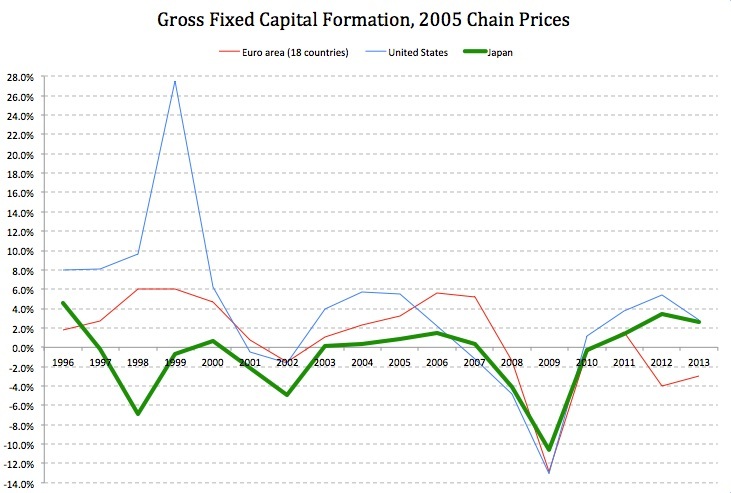 The Japanese deserve kudos for their apparent return to growth. Let us hope they keep it up. In Europe, frustration is growing almost by the day over the endemic recession. Unemployment is an unending problem, especially among the young, which at least in part explains the rise of the EU skeptics all over the continent. The only solution to the perennial crisis that Europeans seem to be able to come up with is to keep growing government, an idea that would only compound the continent’s structural economic problems and send them further into the territory of industrial poverty and stagnation. European Central Bank (ECB) chief Mario Draghi has said he is prepared to use more unconventional measures to spur growth in the eurozone. “We stand ready to use additional unconventional instruments within our mandate, and alter the size and/or the composition of our unconventional interventions should it become necessary to further address risks of a too-prolonged period of low inflation,” he told MEPs on Monday … He said loose monetary policy will only be stopped “when we have complied with our mandate” which is to keep inflation at close to 2 percent. Currently inflation is at 0.4 percent. It is important to remember that the ECB was created in the late 1990s as an institution of monetary conservatism. Its policy goal was limited exclusively to the preservation of price stability. It had no authority to provide funds to governments that ran deficits in excess of the balanced-budget requirement in the EU constitution (a.k.a., the Stability and Growth Pact). It was also beyond the bank’s realm of authority to fight unemployment, which meant a ban on trying to stimulate GDP growth. Today, the ECB has broken through every boundary on its policy mandate. It has participated in vast funding schemes for deficit-ridden states in the euro zone. It has issued a guarantee to buy an unlimited amount of Treasury bonds issued by any “troubled” euro-zone state, thus de facto making a promise for future monetary expansion way beyond what the Federal Reserve ever did during the height of its QE programs. The ECB has also cut interest rates on overnight liquidity deposits that banks make with the ECB. These interest rate cuts have gone so deep that they are now negative: banks literally have to pay the ECB to accept deposits. The last move reeks of desperation. But doing all this has not been enough of a monetary expansion to get the EU economy going, so the bank added a program for favorable lending that was supposed to provide funding for entrepreneurs eager to make massive expansions to their operations – all they lacked was the cash to do it. The ECB has taken a series of steps since the summer to try and boost the economy and head off deflation, including interest-rate cuts and cheap loans to banks. In early September the Frankfurt-based bank cut rates further and announced it planned to buy asset backed securities (ABS). However its lending programme was deemed to have faltered when 255 eurozone banks last week only borrowed €82 billion of the €400 billion available. And why did they not borrow more? Well, according to Draghi banks are afraid to look less solvent than they must in the upcoming “stress tests”. There is actually a grain of truth in that: banks that borrow but cannot lend won’t make any money on the interest margin. However, what Draghi fails to mention is that banks cannot find people and businesses to lend to simply because Europe’s families and entrepreneurs live in a stagnant economy. So long as stagnation prevails there will be no prospect of profits on new business investments. In fact, according to Eurostat national accounts data, gross fixed capital formation – the national accounts variable that reports productive business investments – has been falling almost uninterruptedly since 2008. In fixed prices the decline is 16.8 percent from ’08 to 2013. By contrast, data from the U.S. Bureau of Economic Analysis shows that businesses in the United States increased their investments in 2013 over 2008. The increase was a marginal 1.9 percent, adjusted for inflation, but that is a major sign of health relative European business investments. To make the difference even more clear: in Europe gross fixed capital formation has decreased in five of the past six years since the Great Depression started; in the United States it has increased in four of the past six years. No wonder Mario Draghi is getting desperate. But he has now effectively run out of options, proving what I said already in early June: Europe is now officially in the liquidity trap. That means two things: monetary policy is completely impotent and there will be no way out unless and until legislators reform away the enormous and very burdensome welfare state. And those reforms will not happen. So long as the welfare state remains, people are massively disincentivized from working and incentivized to live on welfare. The government budget is structurally in deficit and the massive supply of liquidity in the economy makes it very cheap for government to do nothing about that deficit. I have said it before, sometimes frustratedly, that Europe is becoming the next Latin America, an economic wasteland filled with the remains of squandered prosperity. But while parts of Latin America are rising again (think Chile and Brazil) Europe continues its slow decline. And the ECB’s desperately-cheap-money policies are not exactly helping. Spain’s economic recovery was underlined as its manufacturing sector recorded its greatest activity in seven years, but the financial crisis has left its mark with separate figures showing a sharp rise in people leaving the country. A snapshot of the state of Spanish factories combining output, orders and employment showed activity rose to a seven-year high in June. The Markit PMI increased to 54.6 from 52.9 in July – with a reading above 50 indicating expansion. That puts growth in Spain’s manufacturing sector ahead of Germany, France and Italy and is further evidence that its economy is outperforming the eurozone as whole. To begin with, it is not very hard to outperform the euro zone, where GDP growth is as close to zero as anything can be. Private consumption is exceptionally weak, and even the OECD has been forced to downgrade its previously optimistic growth forecast for the EU. The struggling Spanish car industry in particular is showing signs of recovery thanks in part to a government incentive scheme, now in its sixth year, for people to upgrade their vehicles. Christian Schulz, senior economist at Berenberg bank, said Spain was benefiting from the reforms that it put in place in response to the financial crisis. “If we add similarly impressive readings for the Spanish services sector, we can safely conclude that Spain is reaping the rewards of its tough labour market reforms of 2012 and is becoming a mainstay of eurozone growth,” he said. The program referred to is one where government offers 1,000 euros toward the down payment on a new car that costs no more than 25,000 euros, provided the buyer trades in a 7-10-year-old, less fuel efficient car. According to at least one report this has contributed to the sales of 300,000 cars in Spain in the last couple of years. There are a couple of problems with programs like these. First of all, they create a sense of entitlement among consumers, who learn to expect their government to chip in. Today it is toward cars, tomorrow – who knows? Homes? Furniture? Haircuts? Secondly, it skews the car market. People buy smaller cars than they otherwise would, sending signals of demand to car manufacturers that are not based on free-market conditions but government subsidies. When those subsidies end because they are too costly for government, manufacturers will be left there with production capacity designed not based on the free market, but on defaulted government promises. Third, the rebate increases the purchasing power of consumers who would otherwise not be able to afford a car. As a direct result, consumers can get approved for car loans with weaker ability to repay them than if there had been no tax-paid incentives program. What happens when those consumers default on their loans? 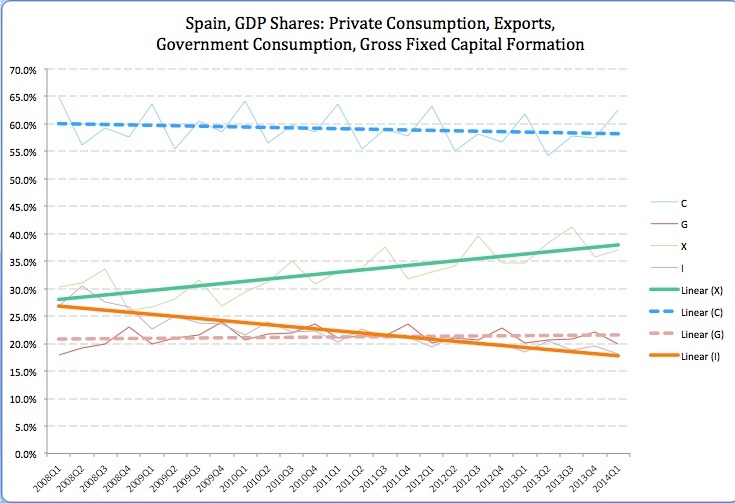 It remains to be seen how important this program is for the weak but nevertheless increase in private consumption that we can see in Spain’s GDP numbers. Adjusted for inflation, Spanish private consumption fell for 13 quarters in a row, from third quarter 2010 to third quarter 2013. In the fourth quarter of last year and the first this year, households increased their spending by, respectively, one and two percent. Does this signal a recovery? It is too early to tell, especially since there was a similar spike in early 2010. But it is entirely likely that the car-buyer incentives program has artificially boosted the shift in consumer spending from decline to increase. This means that the reversal from worse to better – at least in consumer spending – is the result of government spending. Since Spanish government finances are in bad shape due to the economic depression, this only means that the macroeconomic problems that the Spanish government is trying to solve are just being shuffled around. There is more evidence of this. 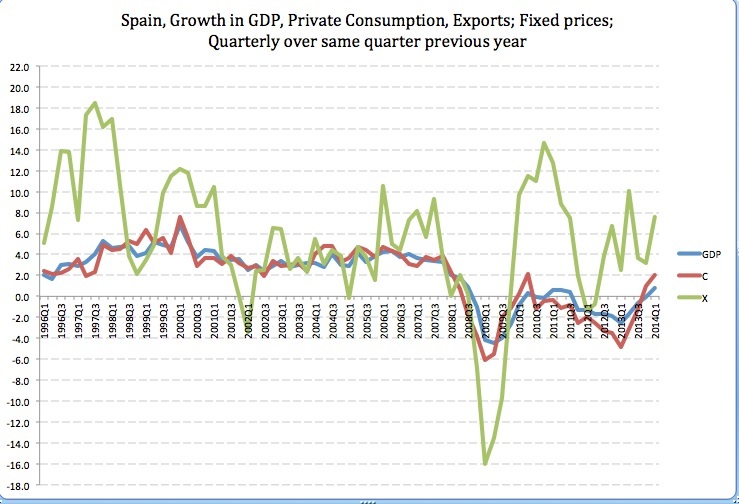 In the figure above, the strongest growth is not in private consumption but in exports. In the past 17 quarters, since the beginning of 2010, Spanish gross exports have increased by an annual rate of 6.7 percent on average. By contrast, private consumption contracted by an annual average of 1.3 percent over the same period. This marks a shift in importance for GDP, with private consumption slightly declining as growth driver, and exports rising in its place. Arithmetically, this makes a lot of sense. A variable that constitutes a small share of GDP grows rapidly for a long period of time. At some point it ceases to be a small variable and instead becomes important for GDP. 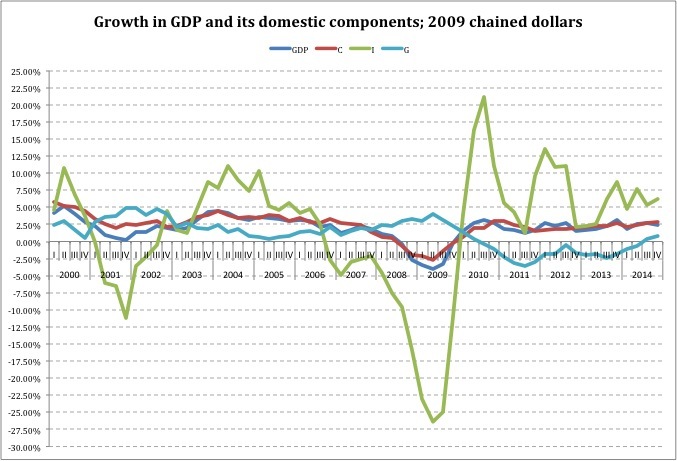 When it does, its effect on GDP increases, accelerating GDP growth while exports still grow at the same pace as before. While, as the green line shows, the exports share of GDP has been growing steadily during the Great Recession, the orange line shows that business investments have been on a steady decline (again as share of GDP). And this decline is all the more dramatic: Spanish businesses have decreased their investments, in fixed prices, for five straight years now. Yes – five straight years. Since the first quarter of 2009 there is not a single quarter with growth in business investments. Measured in fixed prices, the amount that Spanish businesses spent on investments in the first quarter of 2014 was only two thirds of what they spent in the first quarter of 2009. This has happened while, again, exports have been growing solidly. So long as businesses do not reverse the downward trend in investments on a sustained basis, there can be no recovery in the Spanish economy. Growing exports will not generate a recovery, especially not when the growth is concentrated to manufacturing. Modern manufacturers in Europe often import parts and assemble them on European soil. This means that growing exports are followed by growing imports of manufacturing inputs – in essence a passing-through of products that does not have any positive repercussions for the rest of the economy. In January I explained that Germany has precisely this problem. If the exports were a sign of recovery in other EU countries, there would be hope for a recovery across Europe. But that is not the case: everywhere you look in Europe, private consumption and other domestic-spending variables are growing very reluctantly, if at all. The exports that the Euroepans are so happy about are, in other words, bound for other continents, without having any real positive effect on the European economy itself. Europe will not return to growth, prosperity and full employment until its political leadership realizes what the problem is: the big, burdensome welfare state and its high taxes and anti-productive set of incentives that steer people away from self sufficiency and straight into life long career of sloth, indolence and government dependency.